The three major cryptocurrencies which focus on smart contracts and decentralized apps are Ethereum, EOS, and TRON. 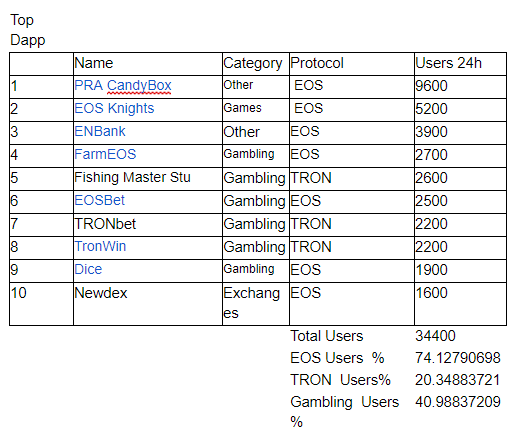 EOS and TRON target the gaming and gambling industry and dApp usage is mainly dominated by gaming/gambling dApps. EOS.IO is a blockchain technology, like Ethereum, for the deployment of decentralized applications and decentralized autonomous corporation. EOS is currently the fifth largest cryptocurrency in terms of market cap ($2.09 billion at press time). TRON is an ambitious project dedicated to building the infrastructure for truly decentralized internet. It is currently at the ninth place in the list of cryptocurrencies in terms of market cap. EOS uses the Delegated Proof of Stake (DPOS) and the BFT algorithm for Consensus mechanism. Delegated Proof of Stake (DPOS) is the fastest, most efficient and decentralized PoS mechanism. It uses a reputation system and real-time voting to achieve consensus. The blockchain is validated by a set of master nodes. The powers in the network are delegated to every member and no single party will be able to control the entire process. EOS block producers (BP) collect transactions in the network, create blocks and broadcast the blocks to other producers. There are 21 block producers, also known as supernodes, that are constantly changing. The BPs use optimized hardware and they will be synced only with those 21 parties instead of the entire network. Block producers will receive block rewards and network prestige in return for their work. Block validators are full nodes that verify the blocks created. A full node is a program that fully validates transactions into blocks and for confirming a transaction, EOS needs only 14 nodes. An EOS supernode produces 6 blocks with a block time of 0.5 seconds and a total of 126 blocks (21 ✕ 6) in 63 seconds (126 ✕ 0.5 seconds). TRON uses an innovative Delegated Proof-of-Stake (DPoS) system in which 27 super representative (SRs) produce blocks for the network. Voters may choose SRs based on criteria, such as projects sponsored by SRs, to increase TRX adoption and rewards distributed to voters. TaPOS Consensus mechanism: In TaPOS, the network requires each transaction to include part of the hash of a recent block header. This requirement prevents transactions from being replayed on forks not including the referenced block. EOS is somewhat centralized for the sake of scalability. Since it has only 21 block producers verifying all the transactions, a small number of representatives are required to reach consensus, instead of waiting on thousands of nodes. This improves the scalability of EOS to a maximum of 4,000 transactions per second. Community members stood against the EOS BP. 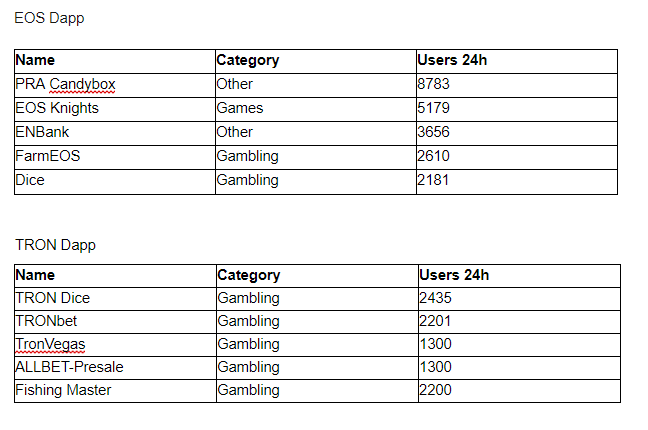 According to data from dappradar.com, the top 5 EOS dapps combined have nearly 23000 daily active users, which is nearly double as compared to Ethereum Dapp users. Large dApp usage in EOS is mainly due to fact that it can handle more number of transaction per second (TPS) (up to 4000 tps) compared to TRON (2000 tps) and Ethereum (15 to 25 tps). According to Dappradar.com, the total number of daily active EOS users is approximately 23,500 -- twice as much as TRON’s dApp users (9,435 daily users). According to rankings from dappradar.com, among the top 10 dApps, the majority of dApps are EOS-based (79%) while those of TRON account for 21%. The total number of gambling-based dApps is 40%. According to the State of the Dapps, there are currently 122 dApps on the EOS platform with 46,650 daily users, which is actually 3 times more than daily users of Ethereum. TRON has 49 dApps, which are mostly gambling-based. The top three dApps on TRON have an average of about 285,000 transactions per 24 hours, far more than Ethereum’s top 3 (2,800 transactions in 24 hours). EOS gives more priority to scalability and performance rather than decentralization. It can process 1,000 to 4,000 transactions per second with no transaction cost. The main drawback of the EOS blockchain is the lack of decentralization, which might prevent dApp developers from using the EOS platform. Other drawbacks include a complicated wallet setup and the difficulty involved in understanding platform’s RAM and CPU protocol. The TRON platform is user-friendly and far better than EOS. It is easy to create an account, pick a username and trade. EOS has faced a lot of security issues after the release of its mainnet. The blockchain faces constant security glitches, which have affected the performance of 27 dApps since November 27, according to Peckshield. TRON recently launched a 1-million-USD TRON accelerator program seeking to assist developers in building decentralized apps on the TRON platform. TRON has enhanced media coverage and advertising, especially with founder Justin Sun constantly interacting with the community through his Twitter account. EOS, on the other hand, lacks a prominent public figure with the same influence. EOS has good scalability, it has some security issues and is less user-friendly. In addition, centralization is also a cause of concern. 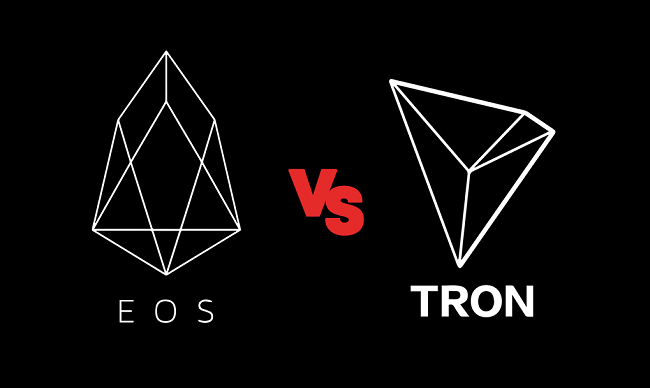 Both EOS and TRON are promising in the games and gambling industry, but TRON has a minor edge over EOS.